176 pages | 174 Color Illus. 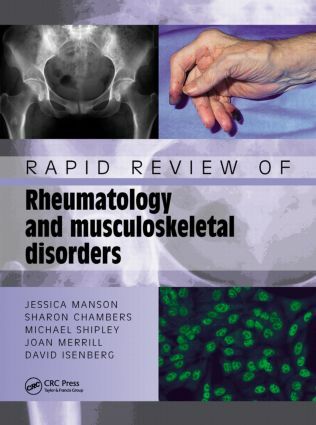 This Rapid Review is a concise, evidence-based guide to the diagnosis and treatment of rheumatological and musculoskeletal disorders. Covering the basic principles of joint examination and key clinical skills, the book describes more than 100 clinical cases especially chosen to illustrate both commonly occurring and more unusual conditions. Each case presentation replicates a real-life situation in the busy world of a typical clinic and is illustrated with superb quality colour clinical photographs. Following the case presentation, a series of questions are posed to simulate the diagnosis process along with answers to the questions and a final diagnosis. Tables with lab values supplement the photos and text. Following the case presentations, the book discusses the top ten rheumatological disease categories including rheumatoid arthritis, spondyloarthropathies, lupus, vascultis and other miscellaneous conditions. The book will become an essential ‘go to’ text for all trainee rheumatologists and general medical practitioners, including specialist nurses, manual therapists and related health professionals. "This book is excellent and it succeeds in providing a glimpse of rheumatology in a fun manner … The simplicity and large number of images make it a quick and fun read."